VIKINGS: Who wants to be King? Who wants to be King? The title says it all we are going to talk about the possibilities of Who could be King and who wants to be king. The difference between the two is not very simple. We have a group that could be king and we have a few who desire power and want to be king, but what if the burden isn´t taken by anyone or everyone it becomes chaos.Chaos the seer foretold or chaos by the meaning of Ragnarök.What will be the most important thing of ruling something like Kattegat? 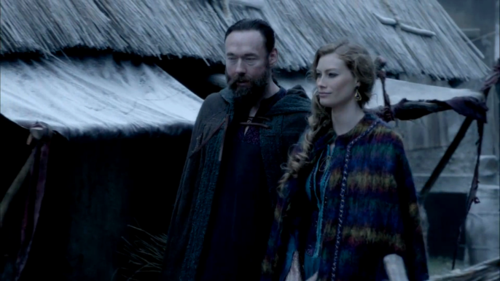 Because Ragnar disappeared, Aslaug has ruled Kattegat that is for sure especially when we see how she talks to Bjorn. Bjorn is her messenger to the other brothers in the cabin nothing more like that. We see in that same expression of Bjorn that he got irritated by her. Why didn't he attack Aslaug while Ragnar was away is he afraid that one of his brothers would avenge her by killing him? So who could be king? Lagertha who is already ruling another country and lived in Kattegat and knows how to rule or Astrid her new lover. Rollo who wants the same power as Ragnar? Floki has failed once in his operation in France but could rule in his insanity? Sigurd who wanted to kill his father when he would return and don't do it. I think it is the wrong question because everyone get's an opportunity to become king of Kattegat. The problem is that it comes with power and power is a burden you need to bear, or willing to take. Why want Ragnar to give up his burden? For that, we need to go way back in time to season 1. He wanted to be Earl because he needed to sail west. He didn't ask to become Earl. In season 2 we see the first difference in the power that Ragnar has and what Ragnar decide. After the betrayal of Rollo, he as earl couldn't kill his brother there was a trail but he decided that a judge needed to decide not Earl like in the first place. In the second season, he becomes famous of his raiding's to the west and when he plots to talk to King Eckbert without having a meeting with then Earl Ingstad and King Horik, King Horik start to plot against Ragnar. 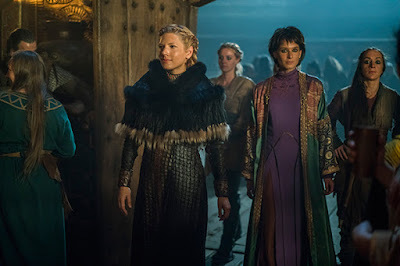 When Siggy decide she wants back her power by sleeping with King Horik, Rollo tries to become more powerful than Ragnar by betrayal him to get together with Jarl Borg, Floki hates some of the decisions Ragnar made and decided it is time to switches over to Horik his team. Ragnar has only one decision to make to stay alive to kill King Horik whether it is a plot together with Floki or from Ragnar himself. He becomes King by decisions of others. If he then goes to Paris and gets defeated multiple times it is a kings burden to keep the riches coming at that time and to succeed in raiding parties he has a burden to bear by keeping a lot from his own people. He knew that Floki killed Athelstan. He knew about the settlement in Wessex. consider him he is done with his kingship. She rules Kattegat already multiple times when Ragnar was away. She rules with her own rules and won't want to change anything religion wise she loves it the old way. She is one of the main characters who is seeking for power. She even rules with Bjorn but not the way Bjorn likes. Bjorn could rule Kattegat but with his choice to arrest Floki and not the favorite ruler by Ragnar because he misjudges after a few situations the one with Floki was one too many according to Ragnar. Bjorn won't kill Ragnar for Kingship because in his eyes he still is his hero. At that time it was normal that the kingship went from father to son. So Bjorn is the truth heir. After she left Kattegat to divorce Ragnar she became Earl by the time she came home she had made a good fortune for her people when she killed Kalf she is the one and only ruler of Hedeby. She would love to seek revenge for what Aslaug took off her not only Ragnar but also Kattegat and Bjorn. Bjorn´s life lies in Kattegat. She would do anything to see Bjorn or herself rule in Kattegat. In my opinion, she doesn't like the idea to attack Kattegat but if that is what it takes she will attack Kattegat because of Aslaug. New lover of Lagertha what is her power to get Lagertha attack Kattegat for her own reason to be queen or is there something else behind Astrid's motif. Because she is a new character so we don't know what she would do. Could Floki be king? It depends if we take back the scene that he and Aslaug had together with Harbard he could but I don't think so. Floki could be seeking that power but it will drive him to madness or into Ragnarök. When Floki is the mythic god Loki he is always seeking for power. He could be a good king if he is Loki but also a trickster. He is a natural leader in Loki but he had a say in concurring Paris and failed dramatically that turned him into madness. I don't see Floki as King but everything is possible. Rollo is in Paris but will he stay there and what will happen when he knows that Ragnar is trading his kingship? Is Rollo still seeking power in Kattegat? We do know he will be back together with the sons of Ragnar or if he is able to give it through will he give the favour to Bjorn. I think he will favour Bjorn. I don't know how he will react on Ivar. Ivar could be the next King of Kattegat but will he kill Ragnar for it at this point I don't think so, because he wants to raid Paris with Ragnar. Will he be king in the future? That is almost certain at least he will be better known as Ragnar. Together with his brother's he will be known all over the world. Sigurd wanted Ragnar dead but doesn't have the guts to kill his dad just yet. 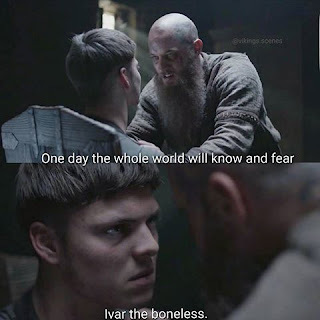 Ivar told Ubbe that he is soft so he definitely won't kill Ragnar.